Distribution: Heath and open woodlands in south-east South Australia. Correa is a genus of about 11 species although there are many forms which are difficult to allocate to any particular species. Botanical revision of the genus is warranted. They are mainly restricted to the eastern states although C.reflexa has a recorded occurrence in the east of Western Australia. Correa pulchella is one of the most beautiful members of the genus and is usually a small varying in habit from prostrate to about 1 metre in height. The leaves are oval in shape and about 15mm long. They lack the conspicuous oil glands which are prominent on the leaves of some other members of the genus. 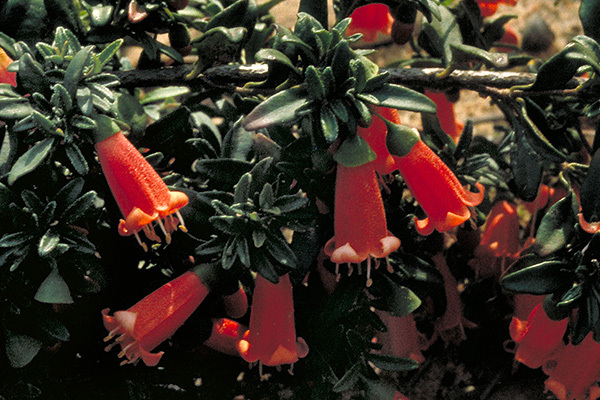 Flowers are orange to red in colour and are bell-shaped being about 20mm long. The flowers produce nectar and attract honey eating birds. Flowering is usually winter to early spring. In cultivation the species is best suited to area of dry summers and it can be short lived in humid areas. It grows naturally in alkaline soils and may require dressings of lime or dolomite if cultivated in acid soils. It favours semi shade to full sun but poorly drained positions are not suitable for the cultivation of this species. In common with most members of the Rutaceae, propagation of C.pulchella from seed is difficult but cuttings usually strike readily from current season's growth.